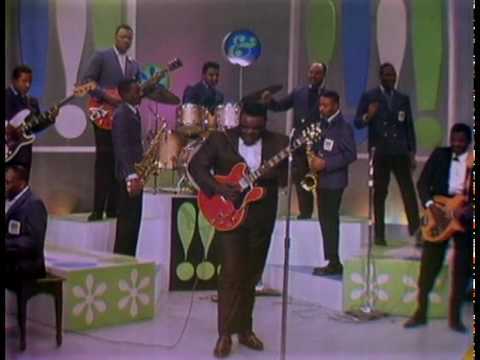 Freddie King is truly one of the greatest electric blues guitar men; an innovative and influential picker unlike any other (though influenced by B.B. King) and with a commanding voice to match. 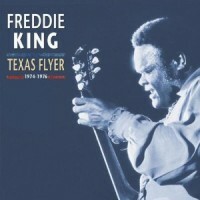 Last year Bear Family released a 7-CD box set covering King’s career from 1956-1973, to much acclaim, and they have now issued the follow-up box set, Texas Flyer: 1974-1976, chronicling the final three years of recorded output from the guitar icon. By the late 1960s King was touring with several prominent rock bands and playing for mainly young white audiences. In 1974 King signed on with Robert Stigwood’s new RSO label (becoming label mates with his devoted fan and disciple Eric Clapton) and his producer Mike Vernon aimed to reintroduce King to a black audience. To do so, the RSO recordings were given more of a soul slant than his early blues rock sides, bordering on R&B at times, and several funk tracks were featured as well. The end result is more than six hours of soulful, blistering blues guitar and gravelly, at times growling, vocals reminiscent of Bobby ‘Blue’ Bland. For fans of blues guitar, this set is absolutely essential. In addition to one and half CDs worth of RSO studio recordings (including the acclaimed Burglar LP), Bear Family has tracked down three and half CDs worth of brilliantly recorded, previously unreleased live performances of King from the same time period. Clapton, who named King as the most influential guitar player in his career, and his band are featured on one recording session and appear on one live performance as well. Tragically, King passed away in 1976 at age 42, just a month and half after the last concert footage heard here. In addition to the five CDs is an 80-page hardcover book beautifully illustrated with rare photos, liner notes by Bill Dahl, and a full discography, as well as a touching essay from longtime band mate David Maxwell. This box set, in conjunction with Bear Family’s earlier release Taking Care of Business: 1956-1973, goes a long way toward preserving King’s legacy with stunning audio quality and meticulously detailed liner notes. This entry was posted in Blues, Popular, Rock, and Misc. by aaamc. Bookmark the permalink.